This week we look back at six England matches from recent decades you won’t find in most record books, with no caps having been awarded. But the matches still generated talking points at the time as England faced a mixture of representative teams and club sides, with varying levels of success. 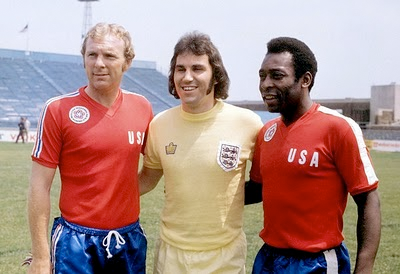 England’s Gerry Francis is flanked by Team America stars Bobby Moore and Pele. At the end of the 1975-76 season, having failed to qualify for the European Championship, England headed to the United States to take part in the U.S. Bicentennial Cup. The four-team tournament would bring attractive matches against Brazil and Italy, before concluding with a clash against Team America. England’s 1966 World Cup winning captain Bobby Moore would be in the Team America line-up along with Pele and other familiar names such as Mike England and Tommy Smith. Playing in an unfamiliar all-yellow strip, England achieved a 3-1 win that guaranteed second place in the tournament behind Brazil. Just over 16,000 were at the John F. Kennedy Stadium in Philadelphia to watch the match. With no caps awarded it meant Kevin Keegan’s two goals and a single effort from Gerry Francis failed to count towards their career totals. A late consolation from Scotsman Stewart Scullion meant Team America had at least scored a goal in the competition. Although pleasing to have achieved two wins out of three in the competition (after a stirring fightback to beat Italy 3-2 in the previous match), there was a feeling England could have enjoyed a bigger win over Ken Furphy’s side in the final match. Three months before being based in Bilbao for the World Cup group stage, England were the opposition as Jose Francisco Rojo enjoyed his testimonial in March 1982. But this wasn’t some light-hearted kickabout for England, as competition was building for players to earn selection in the World Cup squad and this match replaced a planned friendly with France (called off after the sides were drawn together in the World Cup). Only Tony Morley and Cyrille Regis played for England in this match without making the World Cup 22. A big crowd of turned out for the testimonial, as England familiarised themselves with their World Cup home. Kevin Keegan scored England’s goal in a 1-1 draw, but injury would rule him out of his country’s matches at the stadium in the summer. Manager Ron Greenwood did not seem too concerned his side had failed to win, saying: “It was an enjoyable game. The crowd enjoyed it and we won a lot of friends.” Catching the eye for the home side was young goalkeeper Andoni Zubizarreta, who produced a string of good saves to keep England at bay. It would come as little surprise when he later became one of the best-known goalkeepers in Europe with Barcelona and Spain. England fielded teams against English clubs on a number of occasions for testimonials in the 1970s and 1980s. However, these were generally England XIs where past stars might make an appearance; the team might be supplemented by players who never came close to a full cap; and the testimonial recipient would usually be gifted a goal or two to make it dubious how seriously the result could be taken. One exception came in May 1988, when England provided the opposition for Alan Hansen’s Liverpool testimonial at Anfield. It was good news for everyone. Playing England guaranteed a big crowd and a good payday for Hansen, Liverpool fans could pay homage to their team for a tremendous season (albeit tainted slightly by their shock FA Cup Final loss to Wimbledon two days earlier) and England boss Bobby Robson was able to continue his preparations for Euro ’88 by playing against a side – albeit in a relaxed atmosphere – who had been outstanding for much of the 1987-88 campaign. This was no place for guest players, with the exception of Ian Rush returning from Juventus to feature for Liverpool a few weeks before he would rejoin the Reds. John Barnes, Peter Beardsley and Steve McMahon would play for Liverpool rather than England in this match. ‘Better than Brazil’ is one term that has been trotted out about Liverpool that season, in which case it would probably be assumed they were ‘better than England’ too. If the outcome of an end-of-season testimonial match could be seen as a fair barometer of that, then they probably were as they enjoyed a 3-2 win over England in front of more than 30,000. Rush scored twice including a late winner, with Ronnie Whelan also on target for Liverpool and Mick Harford and Chris Waddle replying for England. Daily Express reporter Steve Curry certainly enjoyed it, hailing it as “one of the most memorable testimonials the game has ever staged”. Alas, there doesn’t seem to be much footage knocking about to help confirm his view. Chris Waddle gets in the mood for Euro ’88 by going for goal against Aylesbury United. Less than three weeks after taking on Liverpool, England again went into battle with English league champions. Aylesbury United had just won the Beazer Homes League to win promotion to the Conference and they would surprisingly meet England in a Euro ’88 warm-up at their Buckingham Road home. The match’s existence was supposedly down to journalist Frank McGhee for suggesting to Bobby Robson that England may benefit from a confidence-boosting big win over non-league opponents. And so a fixture that had probably only previously been confined to a few Buckinghamshire Subbuteo tables become reality, just eight days before England’s first match in the European Championship in West Germany. England duly got their big win, although not without a scare as Aylesbury legend Cliff Hercules came close to scoring. Peter Beardsley chipped in with four goals in the 7-0 success, with his achievement parodied 16 years later in Fantasy Football’s Phoenix from the Flames. But alas Euro ’88 would prove a flop for England, who returned home without a point and the Aylesbury fixture (and a similar match in West Germany against Heilbronn) would be held up as an inappropriate warm-up match for a major tournament. But for the non-league players who got to share the same pitch as their country’s leading players it had been a day to cherish. Undeterred by what followed their experience against Aylesbury, two years later England warmed-up for Italia ’90 by taking on the pick of Sardinian players ahead of their opening World Cup match. As well as providing welcome match practice, the game would see England offer their hand of friendship to the island where they would be based for the World Cup group stage – amid genuine concern about how a section of English followers would behave. In a symbolic gesture, Steve McMahon deliberately scored an own goal in the opening seconds. After that England got serious and Peter Beardsley was again to have his shooting boots on, netting a hat-trick to leave the press tipping him as favourite to start against the Republic of Ireland a few days later. Neil Webb also struck three times and Steve Bull bagged a couple, as England proved far too strong for their opponents and reached double figures. Just days after Terry Butcher had allegedly headbutted a Tunisian opponent, Bobby Robson handed him the captaincy in a defiant gesture. This time around, England would enjoy a successful tournament and playing a match like this would not be mocked in the competition’s aftermath. During their warm-up for the World Cup, England had also played against a comparatively strong Cagliari. They had been in ruthless form in that match too, winning 6-0. A fortnight before the start of Euro ’96, hosts England ventured to the Far East to complete their preparations with two matches. After beating China 3-0, the second match of the tour was an odd one to say the least. They basically played against the Hong Kong domestic side Golden, with Everton stalwart Dave Watson (who had scored for England against Aylesbury in the aforementioned match) guesting for them. Fellow former England defender Mike Duxbury was also in the side, along with ex-England Under-21s goalkeeper Iain Hesford and former Wimbledon man Carlton Fairweather. It was certainly dubious how good a test this would be for England after more than two years preparing for the rigours of Euro ’96. There was surprisingly substantial media coverage of the match, to the extent that the BBC deemed it worthy of highlights twice in one day on Sunday Grandstand and Match of the Day. A goal from Les Ferdinand gave England a 1-0 win, which hardly represented the convincing win they hoped for. And things got a whole lot worse for Terry Venables as the antics of some of his players on the tour made front page news in the days leading up to the tournament. This trip would always be remembered for the wrong reasons.